Senior director of food and agriculture for the Humane Society of the United States. To keep up with Americans’ demand for their meat, broiler chickens are selectively bred and genetically altered to produce bigger thighs and breasts, the parts most in demand. They reach market weight of three and a half pounds in seven weeks. Their hearts, lungs and legs often give out before they’re 2 months old, leaving many lame or lifeless on the warehouse floor. 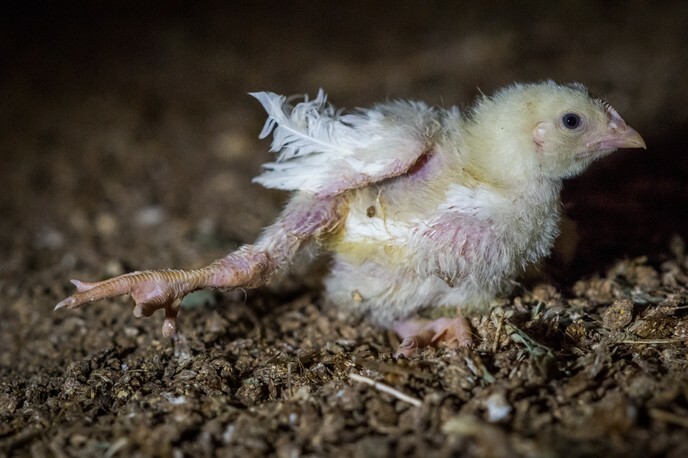 Their beaks and toes are severed without anesthesia, and the broiler houses are usually kept darkened at all hours to prevent fighting among the birds. All birds—egg-laying hens, meat chickens, turkeys, ducks, geese and others—are excluded from all federal animal protection laws, including the Humane Slaughter Act. Many miss the electrocution step because they lift their heads in distress—The USDA estimates millions of birds are therefore fully conscious when killed.